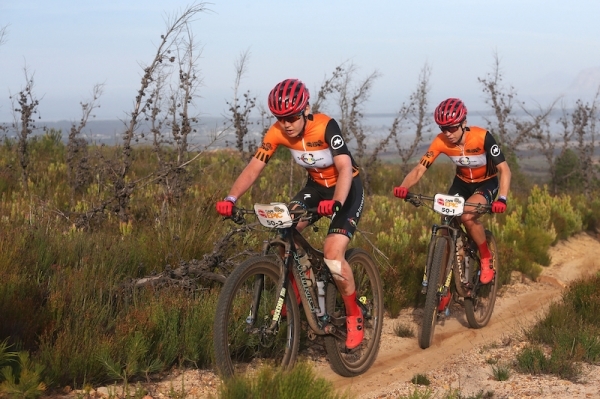 The Investec-songo-Specialized duo of Annika Langvad and Anna van der Breggen extended their lead during Stage 2 of the Absa Cape Epic despite changing their strategy mid-race on Tuesday. The MTB and road world champion pairing made the decisive move about three-quarters of the way through the 90km stage from Hermanus to Oak Valley Estate in Elgin; but their plan before the start was to not attack their nearest rivals, the Kross-Spur Racing duo of Ariane Lüthi and Maja Wloszczowska. "Yesterday (Monday) we were quite broken when we crossed the finish line, so today we actually wanted to try and save energy as much as we could," said five-time World Marathon Champion Langvad as she recovered after the stage. "It was so far today that we just wanted to try and hang on to (Lüthi and Wloszczowska), but at the last big climb we could feel that they were fading and so we pushed the pace a bit and got a gap. The climb is at the end of the stage, so you need to time it well to have something left in the tank after the climb." At the end of the stage Langvad and Van der Breggen had opened up a two minute gap which leaves them with a healthy cushion of close to eight minutes going into the 107km Stage 3. Wednesday's stage is a tough out-and-back loop from Oak Valley that takes in the famed Groenlandberg climb and its treacherous descent. The Summit Fin pairing of South Africa's Candice Lill and her German partner Adelheid Morath crossed the line third and they are now 18 minutes off the pace in third position overall. Despite building a big advantage before the riders have even reached the halfway stage of the eight-day event, Langvad refuses to be drawn into any talk of a clean-sweep of eight wins in eight stages. "Nothing about this race is ever sure until you cross the finish line – but so far so good," was as far as she would go toward contemplating victory at Val de Vie Estate on Sunday. Langvad's Olympic Road Champion partner also refused to look too far ahead, but was clearly pleased to have come through the transition stage to Oak Valley unscathed. "I am really tired, but I am really happy with today's stage," said Van der Breggen after the finish. "We stayed with Maja and Ariane on the downhills and the technical sections, including the Land Rover Technical Terrain. We managed to keep up without crashing – and it was very easy to crash today because it was very fast. So that makes it a good day for me." "I knew that the time would come (when Langvad and Van der Breggen would break away)," said a philosophical Lüthi after crossing the line. "They are just playing it really, really smart. They are excellent riders and know how to play the game. "They did not need to do any work in the front. It is our task to do that as we try to get away from third place. So I knew the moment would come when they would pull away, but it was good to ride with them and I was super happy to get a gap on third. "As long as we can play it like that I am super happy," added Lüthi.